Design Trust projects often culminate in a publication of guidelines, recommendations, or findings from our projects. These publications are produced by the Design Trust and available for a nominal fee that helps offset printing costs. Many of our publications can be ordered from Amazon.com. Others are out-of-print and only available as a digital download. Details can be found on each publication page. Call 212-695-2432 x5 or send an email to orders@designtrust.org. 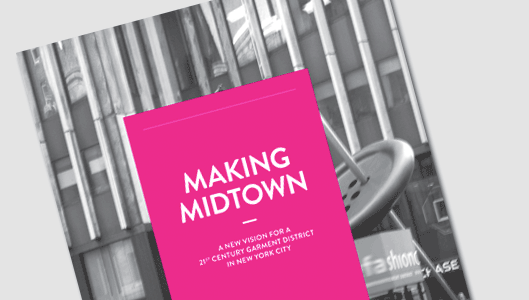 Providing a roadmap for revitalizing the Garment District with fashion design and manufacturing at its core, offering a unifying vision and three main strategies to accentuate and amplify the District's existing assets to create a 21st century, mixed-use creative district.